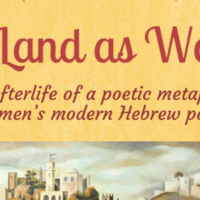 From the Syllabus: This seminar will focus on ways contemporary literature and other arts in Israel and surrounding Arab countries have been informed and influenced by religious traditions (primarily, though not exclusively, Jewish and Islamic) as well as various other aspects of culture. At the center of our discussion, thus, will be the intriguing, complex relationship between culture and artistic production. Questions regarding language, identity, gender, geography, borders, exile and migration, history, homeland, and memory will figure prominently.